Ballymena defender, Scott Whiteside is held off by Crusaders' Paul Heatley. BALLYMENA United defender, Scott Whiteside knows the Sky Blues can’t allow their standards to slip as they prepare for a tough trip to Clandeboye Park. David Jeffrey’s men have made an encouraging start to their league campaign with victory over Dungannon Swifts and a 2-2 draw against champions, Crusaders at Seaview. 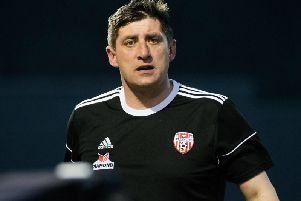 Ards coach Colin Nixon admits he's down to the bare bones for the visit of Ballymena. However, Whiteside (21), who has made an impressive introduction to life at the Showgrounds following his summer signing from Derry City, refuses to get carried away. Indeed, he expects Ards to provide a tough test as they bid to get up and running after two straight defeats. “We’ve got off to a super start but we all know that’s all it is so far,” said the ex-Rangers trainee. “The game against Ards is going to be just as big as the one against Crusaders last week. “We can’t get too ahead of ourselves as it’s only the third game in and there’s a long season ahead. “Ards haven’t got a win yet but they were unlucky against Crusaders. It will be a tough game and if our mindset isn’t right it could be an upset. We’re under no illusions this week it’s going to be very tough. Ards boss, Colin Nixon certainly doesn’t have his sorrows to seek given his mounting injury list. Sean Noble was stretchered off during last weekend’s 2-0 defeat to Glentoran while David Elebert and Kym Nelson were also substituted following injuries leaving Nixon counting the cost. Midfielder Noble could potentially miss the rest of the season with a suspected anterior cruciate ligament tear - the club were still awaiting results of an MRI scan last night - and Nixon admits his side is down to the bare bones. “It’s well documented we were absolutely decimated through injuries which completely wiped us out,” said the Ards boss. “And to be honest it’s going to be the same on Saturday. We probably wouldn’t even have enough to field subs so we’ll have to bring some of the U20s. “We have a small squad and a few injuries is going to hurt us but we’ll have to dust ourselves down and prepare accordingly for a team which is playing very well. “We’ve had horrendous luck so we’ve just got to stick together and work our way through it. I believe if we work hard and stick to what we’re good at the results will come.